Today’s Woman Crush Wednesday honoree is probably no surprise to anyone aware of my recent Foodie Fieldtrip Friday. 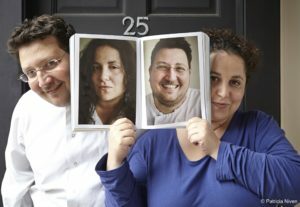 I visited the wonderful restaurant Honey and Co in London and had the most amazing foodie experience. I had been there before with my husband for dinner, but this time was extra special. 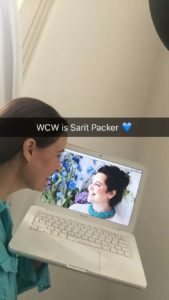 Because I got to meet one of the owners, the incredible Sarit Packer. I didn’t post a pic of us as she was in her chef’s uniform in the middle of a busy lunch service. But she gave me a great hug and we had wonderful chats. I was just blown away by this amazing chef who infuses her food with so much LOVE that I was busting to do a day devoted to her! 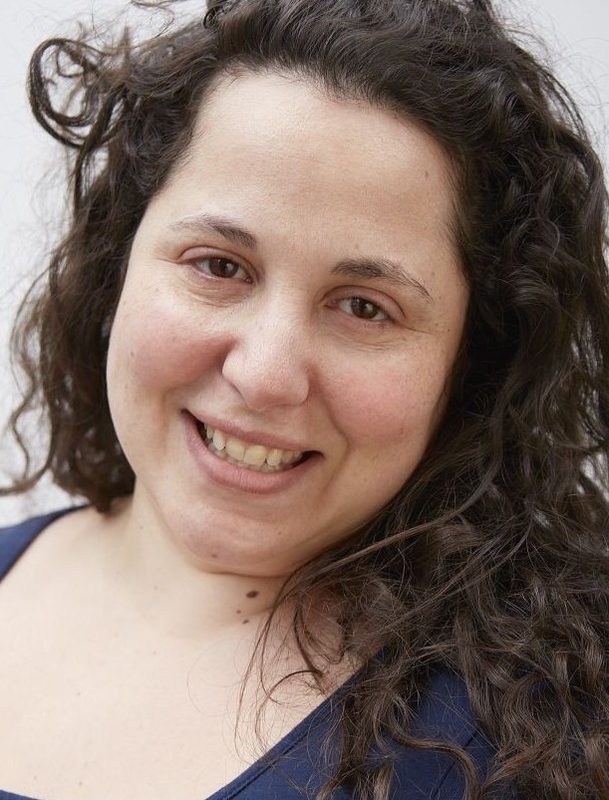 No offense to Sarit’s lovely husband Itamar Srulovich who is her partner in their restaurant and cookery books, but since this is Woman Crush Wednesday until I have a separate day for Couple Crush, I am going to let the light shine on Sarit. My feeling is he won’t mind a bit, but in essence it is also a reflection on him. Their fluid collaboration is evident as the tone in the restaurant is loving and supportive. 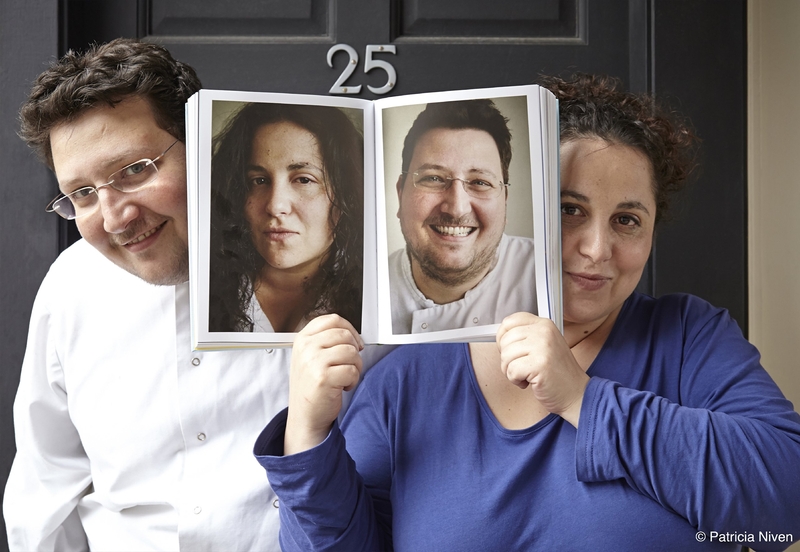 In fact in the pages of their award winning cookery books you will find unctuous photos of food of course, but also pics of the beautiful staff which are really part of the family. 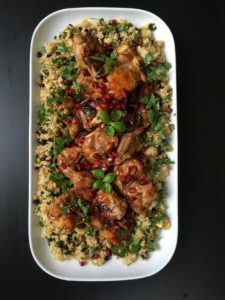 As I mentioned in my Foodie Fieldtrip Friday post last week, I have tasted Sarit’s delicious Pomegrante Molasses Chicken with Bulger Salad, though I have never made it. And since each WCW I take on a recipe I have never cooked before, I couldn’t resist trying to recreate it on here. 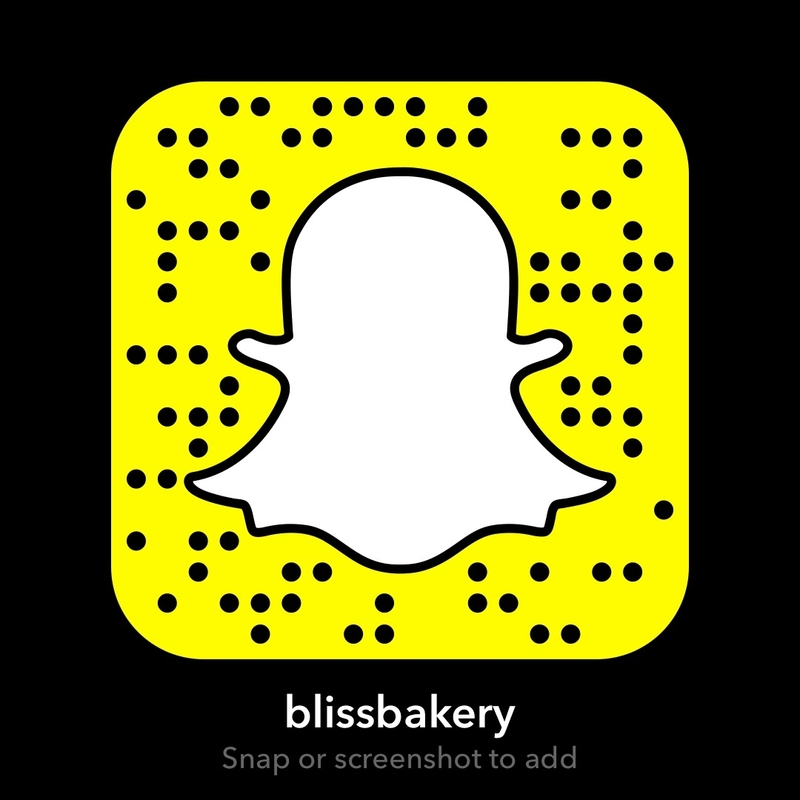 I will also be doing a tutorial live on Snapchat (username blissbakery). This dish is one that I ordered when Hubby and I ate at Honey and Co for our anniversary. No joke, I have literally dreamt of it ever since! It is the perfect combination of sweet and tangy. The meat of the chicken melts in your mouth. 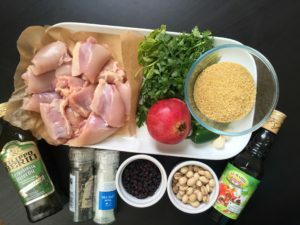 Now I will follow this recipe to the letter, but I am sure Sarit packs it with a secret ingredient that I hope to achieve. 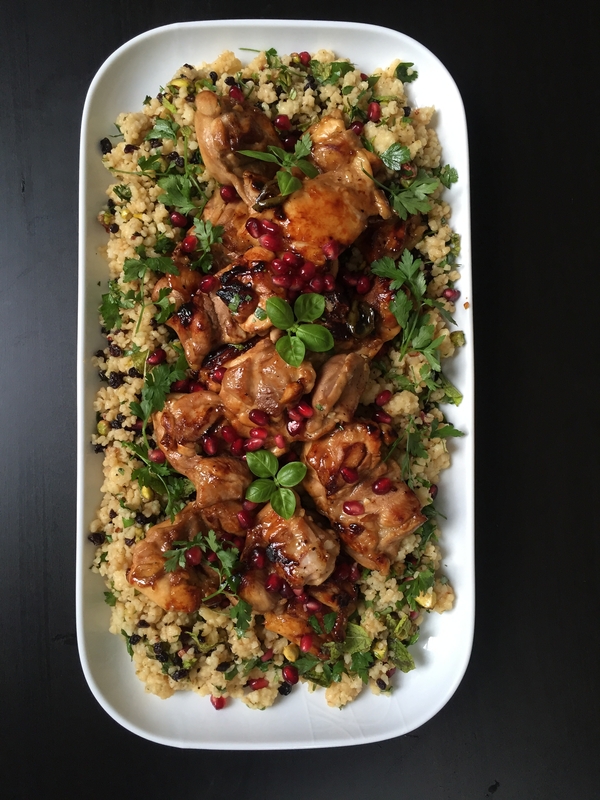 This was probably one of the most anticipated recipes I have ever made. Why? Because when a taste is so prominent in your mind even your subconscious dreams of it, you wonder if it will match up. Guess what? This recipe didn’t disappoint. 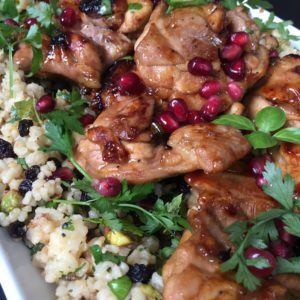 It was simple to make, and so flavorful! The various textures and colors are like a sensory explosion for the eyes and mouth. In fact, it looks like a platter of jewelry the way it glistens. And the aromas are better than any home fragrance candle! Though I have to admit, I always think food tastes better when someone else makes it. It is feeling the cook’s love in each bite. This is the soul of Sarit’s cooking and why I adore her so much. She began cooking at age five and has worked in some of the best kitchens in the world. 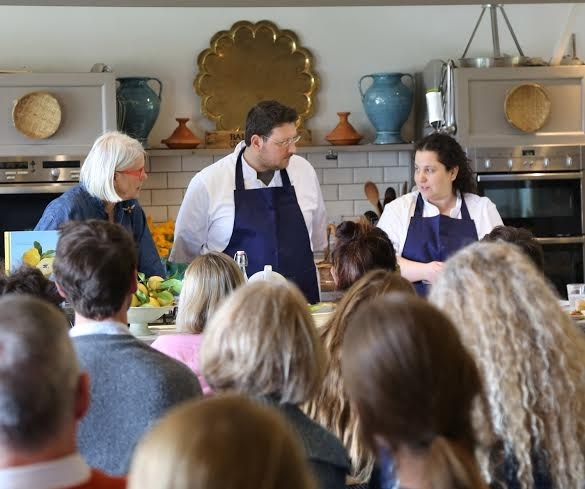 She pays homage to her culture and family recreating the food experience not just the actual dishes themselves. This is why Honey and Co feels like home when you eat there. Not to mention that Middle Eastern Cuisine is such a communal culinary experience anyway with those large shared platters of yummy food. So that is what my hubby and I are going to have tonight! Here in our London flat! A large delicious platter of love with some pomegranate molasses chicken! Thanks Sarit for all you have done for the gastronomic world. As well, you’re a beacon of light for all female chefs showing that you can make a success of it while still retaining your essence. You are LOVE personified!